Here's the press release with specs. The attachment at the bottom is the PDF press release directly from Panasonic's site. Panasonic announced today at CES 2016 two new camcorders into its 4K Ultra High Definition line-up (HC-WXF991 and HC-VX981) and three into its Full-HD camcorder line-up (HC-W580, HC-V380 and HC-V180). 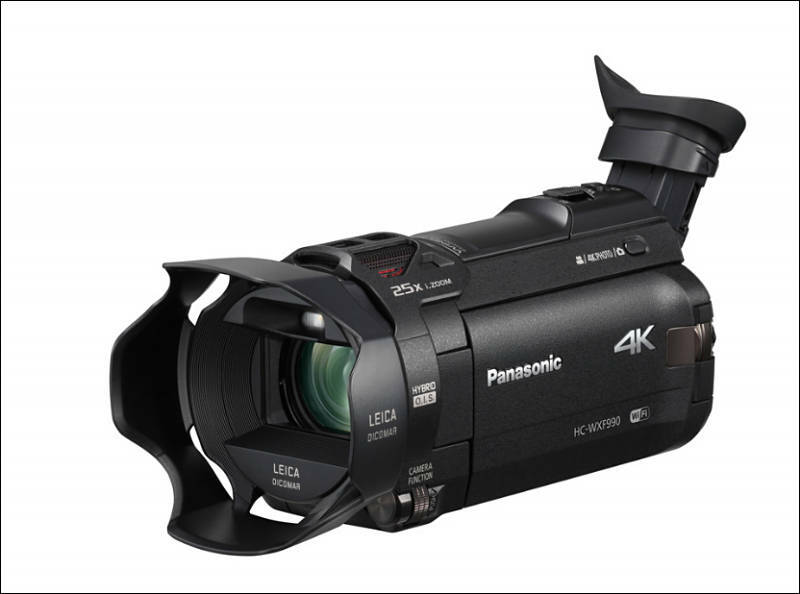 As a leader in 4K technology, Panasonic’s new 4K camcorders enable in camera 4K editing tools and the company’s innovative 4K PHOTO mode, alongside features unique to Panasonic such as Wireless Multi Camera and enhanced cinemagraphic functions to simplify ease of use for any user. These new 4K camcorders build on the success of Panasonic's first 4K camcorders which were introduced to the market last year. By combining a wealth of advanced imaging technologies such as the LEICA DICOMAR Lens, BSI Sensor and Crystal Engine 4K, beautiful 4K images that boast four times the resolution of Full-HD can be captured for later viewing. In addition, high-speed, high-precision auto focus technologies, highly critical for 4K shooting, help to increase image quality further. Also by recording in 4K PHOTO mode, the user can obtain 8-megapixel still images of decisive moments that even the burst shooting of a DSLR camera struggles to capture. These 4K technologies are concentrated into a body that is almost as compact and lightweight as Panasonic Full-HD camcorders. The HC-WXF991 is packed with advanced functions and features to satisfy the needs of both professionals and high-amateurs. With the new tiltable viewfinder, this model makes it easier to capture subjects more precisely. Cinema-Like Effects are new features that allow the use of shooting techniques seen in the movies, such as Slow & Quick Video, Slow Zoom, and Dolly Zoom. This high-end compact 4K camcorder is a great tool for creating cinema style videos. New 4K Cropping cuts out Full-HD resolution video from 4K footage internally within the camcorder. It allows post edit effects to be added to a recorded video, such as zooming2, panning3, tracking and stabilizing. The edited video is saved in Full-HD format. This function is especially appreciated by those who want to create high-quality Full-HD videos. Wireless Multi Camera is a new function evolved from Panasonic's original Wireless Twin Camera, which enables picture-in-picture recording using a Wi-Fi-connected smartphone as a sub-camera. While Wireless Twin Camera links to only one smartphone, Wireless Multi Camera connects to as many as three smartphones and records up to two sub-window images instead of one. This lets the user shoot from a variety of angles and viewpoints to capture a level of emotional impact that simply is not possible with a single camera. All new models feature Panasonic's original Level Shot function, which detects and corrects the tilting of captured images, as well as 5-Axis Hybrid O.I.S.+. No matter which model is selected, these functions thoroughly suppress blurring caused by various types of hand-shake and automatically correct the tilting of captured images that may be unnoticed by the camera user while recording. The recording mode can be changed to Quick Video during slow motion shooting. By combining Slow Video and Quick Video, the user can add dramatic effects to motion-filled scenes. Slow zooming, which is also often used in cinema films and difficult to do manually, is easy to operate. It lets the user add tension to otherwise simple scenes, and express emotional shifts in subjects. This technique zooms only the background while maintaining the subject's size to express feelings such as confusion, distress, or surprise. The resulting footage can be thrilling and create suspense in the film. Smooth slow motion video turns everyday scenes into works of art. The camcorders include the Baby Monitor feature which enables you to check on a sleeping baby in another room with the camcorder connected to home network with a smartphone. You can call out to the baby using your smartphone or have a notification sent to your smartphone when your baby's crying voice or other sound is detected. You can also provide live streaming of video over the Internet using USTREAM. Hands on. It's in German. Sony present 4K looks even better, due to their build in gimbal like stabilizer and 100mbit in 4K.